It may be small and often overlooked in favour of Peru and other larger South American countries, but Ecuador might just be the ideal getaway. Within its borders are the best of the New World, ranging from sandy beaches to colonial architecture and staggering peaks to dense rainforest…and that’s just the beginning! Check out our Ecuador Tourism Guide to get started! Thanks to Ecuador’s diverse landscape and equatorial location, the best time to visit depends on where you plan on going. Generally, the highland cities are at their best between June and September while the southern coast and Galapagos Islands are best seen between December and April. That being said, you can visit anytime of the year, just expect some months to be cooler and rainier (dependent on where you are). Be sure to look up the expected climate in your chosen destinations before travelling. Ecuador is a relatively small South American country located in the northwest of the continent along the Pacific Ocean. It shares borders with Colombia to the north as well as Peru on the south and east. How do I travel Ecuador? Ecuador is one of the easier South American countries to navigate thanks to its smaller size and a solid transportation system. Buses are the main mode of public transportation, though they do vary in quality and comfort. Trains are a decent way to see the sights, but they usually serve as tourist-oriented daytrips. Driving is also an option but keep in mind that while the infrastructure is greatly improved, there are still dangers on the Ecuadorian roads. The vast majority of the Ecuadorian population speaks Spanish, although some indigenous languages can still be heard throughout the country. In some popular and highly developed parts of the country you will hear English, but you should not count on getting by without at least some rudimentary Spanish phrases. Located high in the Andes Mountains is Ecuador’s most picturesque city. The mountain setting will undoubtedly turn heads the minute you fly in, but it’s what lies inside that makes Quito such an alluring destination. The Old Town is one of the best in the world (at least in the Americas), with the colonial architecture and history just as prevalent as it was all those centuries ago. It’s truly a living breathing museum that welcomes visitors throughout the year. 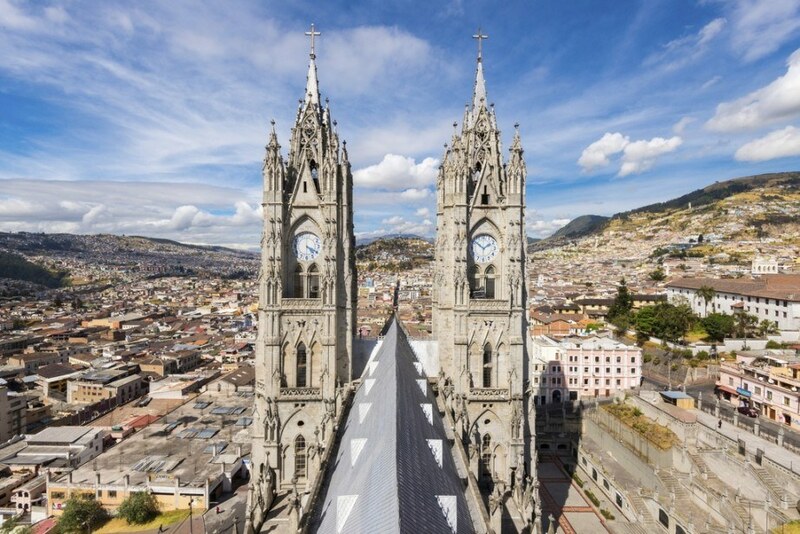 That would be enough to make Quito a must see, but the Ecuadorian capital has a growing food scene and ample nightlife. In short, there’s more than enough to see and do to last an entire vacation! It may not quite rival Quito’s world-renowned reputation, but the Ecuadorian highland’s other crown jewel is just as worthy a destination. Cuenca’s colonial architecture and heritage is just as prominent as the capital, with abundant remnants of the pre-Colombian and Spanish past. 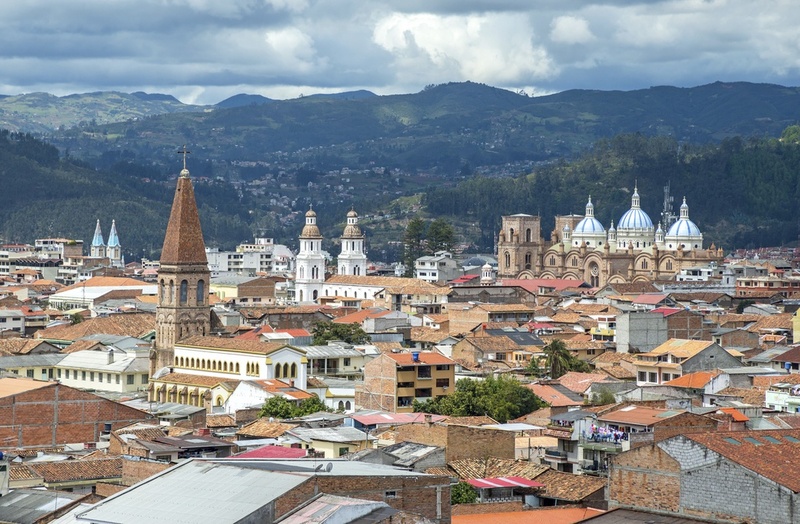 Cuenca also boasts great weather and a more laid-back vibe than Quito, making it a favourite of those who just want to take in the sights at their own pace. Both cities also serve as ideal destinations for venturing out into the thin-air highlands of Ecuador…just make sure you come prepared! For something completely different, you have to descend the high peaks of the Andes and make your way southwest. Keep going until you reach the Pacific and you’ll to find yourself in Salinas – the largest and most popular coastal resort in the country. It delivers exactly what you’d expect: sandy beaches, tons of amenities, and big crowds during the high season (December to April). It may not be the most authentic experience but the waters are warm, and when it comes right down to it that is what makes a good resort. It may be Ecuador’s largest city and commercial heart, but coastal Guayaquil is often overshadowed as a travel destination when compared to Quito. That being said, this large port has plenty to offer. While some of the shanty towns that contribute to the urban sprawl are better avoided, the picturesque riverfront, colonial architecture, and vibrant cultural and bar scene more than makes amends. While the Andean highlands and Pacific coast both offer unique experiences in their own right, the third part of mainland Ecuador can’t be overlooked – the Amazon Rainforest. To start your journey, you’ll want to travel to the eastern region known as the Oriente, where the peaks of the Andes give way to the lush, dense rainforest in the Amazon Basin. You’ll find amazing hot springs, active volcanoes, waterfalls, and a huge array of wildlife. 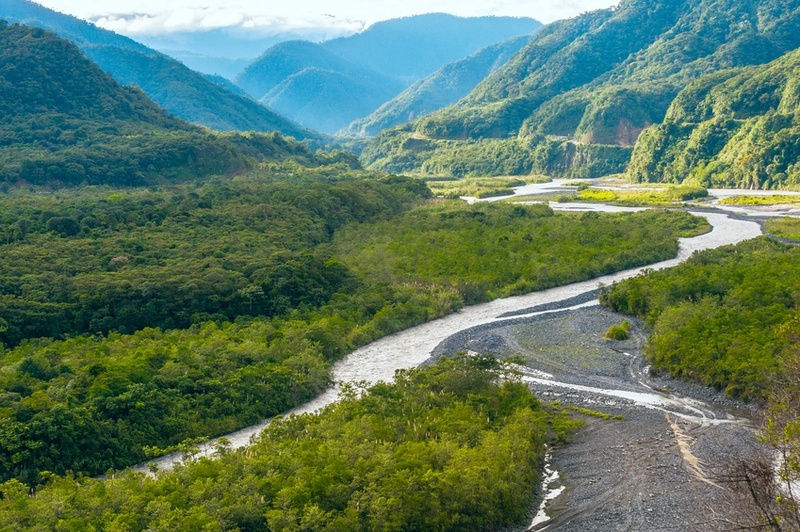 It’s not always the easiest place to explore, some excursions head deep into the remote waterways and thick undergrowth, but it is one of the most unique and rewarding experiences in Ecuador. 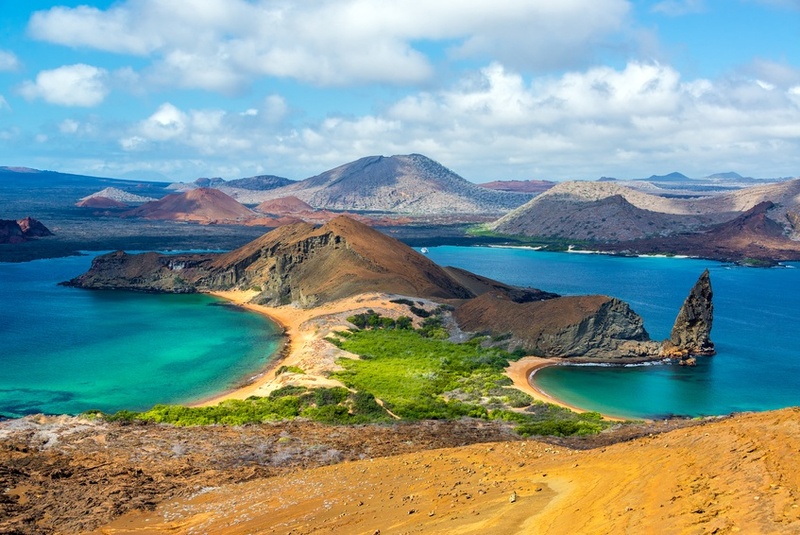 For all the beauty that mainland Ecuador offers, the Galapagos Islands steal the show. Composed of 19 islands about 1000 kilometers off the coast, the Galapagos are one of the world’s most famous and delicate ecosystems. Made famous thanks to their connection to Darwin and his vital research on evolution, it’s easy to see just how the Galapagos were able to inspire generations of naturalists. Observing the wildlife (which includes giant tortoises as well as unique birds such as the amusingly named blue-footed booby) is what most come here for, and it’s well worth it for enthusiasts and first timers alike. Don’t expect sandy beaches with Caribbean style resorts, but the volcanic Galapagos islands offer something much more unique and memorable (plus you can always head back to Salinas after visiting!). Flights between Pearson and Ecuador vary depending on your chosen destination. The most common point of arrival is the capital Quito, which is often the cheapest of the bunch. 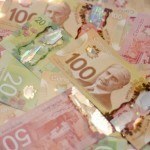 On average a round trip flight starts around $740 Canadian. You can book cheaper packages and deals depending on what’s available, so be sure to shop around to find the best price point possible. How much does it cost to visit Ecuador? 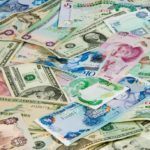 Since the year 2000, Ecuador has used the US dollar as its official currency – making it one of the more simple South American countries to gauge spending in. Prices in the country are, for the most part, pretty cheap, though it will depend on the current exchange rate between USD and CAD. 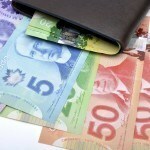 That being said, you can expect to spend about $44 Canadian a day with a budget of $16 for food and $16 for accommodation. If you’re careful, you can bring costs down to as low as $18 a day while high-end travel in Ecuador comes in at about $108 a day (which isn’t too bad all things considered). Before we get into safety, we have to touch on the current health issue with regards to the Zika virus. Spread by mosquitos, the sickness is usually mild and short term, resulting in fever, headaches, rashes, muscle pain, and other effects. That being said, pregnant women (and women considering becoming pregnant) should avoid the country for the time being. Be sure to talk to a healthcare professional before deciding to travel to Ecuador. There is no nationwide advisory according to the Government of Canada, though a high degree of caution is recommended throughout due to crime and the possibility of natural disasters. In addition, there are some regional advisories. Travel is not recommended to; the city of Montañita, the provinces of Esmeraldas, Manabi, and Santo Domingo, the border region with Colombia, and the region south of Cuenca. Petty crime is a common problem in the cities. You should not carry valuables with you and try to avoid projecting wealth. More violent crime is also known to occur throughout the country including armed robbery, assault, and express kidnappings. You should also avoid any and all demonstrations, as they could turn violent. While the roads are greatly improved, there still remain many dangerous areas. In addition, local driving practices can be unpredictable and frightening for the uninitiated. If you plan on venturing out into the mountains or rainforest, make sure that you have proper provisions and someone knows where you are going. For more on travel safety, check out the Canadian Travel Advisory for Ecuador. Share your experience in the comments section! You can also learn more about Ecuador in the Country of the Week, and then buy your US dollars with FXtoGO.